While the title of this report is guilty of some exaggeration, by just looking at the temperatures across New Jersey the past two Februaries you would not be far off the mark. The mildest February by far occurred in 2017 (40.4°), while this past February 2018 came in second mildest at 39.2°, just edging out 1998 (Table 1). This was 5.8° above the 1981–2010 mean and an impressive 8.3° above the 1895–present mean. The difference between mean periods further illustrates how Februaries in recent decades have been milder overall than earlier in the 20th century. So does the fact that February 2018 was milder than 62 of the past 123 Marches (February 2017 was milder than 70 Marches). Table 1. The ten warmest Februaries across NJ since 1895. Not to be ignored due to February’s warmth, monthly precipitation certainly delivered in an impressive manner. The average statewide rainfall of 5.97” ranks as the third wettest on record. This is 3.17” above the 1981–2010 mean (2.87” above the period of record mean) and is the wettest February in well over 100 years (Table 2). Table 2. The 10 wettest Februaries across New Jersey since 1895. Most of the February precipitation fell in the form of rain. However, there were several snowy events in central and northern areas that brought out the plows. Statewide snowfall averaged 3.8”, which is 4.3” below the 1895–present norm. The negative departure was greatest in the southern third of the state, where, on average, only 0.4” fell (-6.1”). Central Jersey saw 5.8” (-3.2”), while the north was closer to average at 8.2” (-1.9”). Through February, the seasonal snowfall total across NJ has averaged 20.7”, or just 0.4” below the long-term mean. Leading the way is the High Point Ranger Station (Sussex County; 1500 foot elevation) with 50.7”. Rain or snow fell on quite a few February days, leading to the impressive monthly precipitation average mentioned above. Individual stations stood out on the high end, led by Southampton (Burlington) with 8.03” of rain and melted snow. This was followed by Washington Township (Gloucester) with 8.00”, Evesham (Burlington) 7.97”, Medford (Burlington) 7.92”, and Pitman (Gloucester) 7.90”. Some 29 CoCoRaHS stations came in with over 7.00”. On the drier side, Sea Isle City (Cape May) managed to pick up only 4.38” (still well above average), Middle Township (Cape May) 4.48”, Port Republic (Atlantic) 4.64”, and Andover (Sussex) 5.11”. Clearly, the southwest part of the state that was wettest, while the far southern coast and northwest received the least precipitation. Snowfall totals were highest in the northwest, led by Bethlehem (Hunterdon) at 13.0”, Randolph (Morris) 12.8” and 10.5” (two locations), Califon and Glen Gardner (both in Hunterdon) 12.2”, Clinton (Hunterdon) 11.5”, and Mt. Arlington (Morris) 11.1”. A rather weak event started off the precipitation cascade, with light rain, some of which turned over to freezing rain and snow, falling from late on the 1st into the morning of the 2nd. Totals of rain and melted snow were within about 0.10” of 0.25” most everywhere, with slightly higher marks of 0.43” in Berlin (Camden) and Bethlehem, and 0.35” in both Holland Township (Hunterdon) and Mt. Olive (Morris). Snow accumulated to as much as 3.8” in Bethlehem, 1.5” in Mt. Arlington, and 3.5” and 2.9” (two stations) in Highland Lakes (Sussex). Only higher elevations were whitened, with at best a few tenths of an inch of snow elsewhere in the northwest. A statewide rainfall event, accompanied by a bit of snow, sleet, and freezing rain in central and northern areas at the start, occurred during the afternoon and evening of the 4th. Most areas received 0.50” to 1.00” of liquid, the most falling near the coast, and the least in the northwest. Galloway (Atlantic) received 1.38”, Lavallette (Ocean) 1.20”, and Lacey Township (Ocean) 1.18”. The only reports of more than an inch of snow came from three observers in Blairstown (Warren), with 1.1”, 1.2”, and 1.5” totals. Another statewide storm arrived around dawn on the 7th and departed during the evening. The precipitation began in frozen form in many locations, continuing well into the day as freezing rain in the northwest. Most of NJ received 0.75”–1.00” of rain and melted snow, the exceptions being the far south and northwest where closer to 0.50” fell. Top totals included 1.14” in Madison (Morris), Chatham (Morris) 1.12”, Rockaway (Morris) 1.08”, and Harrison (Hudson) 1.07”. More than an inch of snow fell north of Interstate 78, except for lesser amounts in the northeast near Interstate 95. Top reports in counties where at least 2.0” fell included 2.0” in Ramsey (Bergen), Flemington (Hunterdon) 2.2”, Green Pond (Morris) 2.0”, Wantage (Sussex) 2.5”, and Blairstown 2.0”. A truly wet event, especially in the midst of winter, a season with less atmospheric moisture usually available due to colder conditions, began midday on the 10th and persisted through the evening of the 11th. The atmosphere was churned up enough for thunder to be heard in Ocean County, and rainfall totals were large enough to generate some stream and small river flooding in southwest and central counties. Of 198 CoCoRaHS observations, 19 had totals from 3.00”–4.02”, the most at Tabernacle (Burlington), 61 were between 2.00”–2.99”, and 101 collected from 1.00”–1.99”. Other top totals included Medford 3.96”, Salem (Salem) 3.90”, Evesham 3.87”, and Woodstown (Salem) 3.86”. Montague (Sussex) with 0.75” and the three Blairstown stations, each with 0.84”or 0.85”, had the lowest totals. Rain next fell from late evening of the 15th through the early morning of the 16th, this time primarily in central NJ. There were also a few afternoon showers on the 16th, which brought the event total to 0.95” at Burlington (Burlington), 0.94” in Jackson (Ocean), and 0.88” at Howell (Monmouth). Totals tapered off to 0.10”–0.20” in the far south and northeast. The snowiest event of February began as snow in most of the state during the early afternoon of the 17th, quickly turning to rain in the south while remaining snow elsewhere. This quick snow “thumping” ended during the evening, but not before generating totals of over 4.0” in 13 counties, of which nine saw 6.0” or more (Table 3). The most snow fell from northern Hunterdon/southern Warren northeast into Bergen, tapering to 5” to the northwest and below an inch in the southeast corner of NJ (Figure 1). Rain and melted snow amounted to as much as 1.02” in Pittsgrove (Salem), 1.01” at Estell Manor (Atlantic), 0.97” in Mt. Olive, and 0.93” in Kearny (Hudson), and was generally between 0.50”–1.00” elsewhere, except 0.25”–0.50” in the far south and northwest. Table 3. 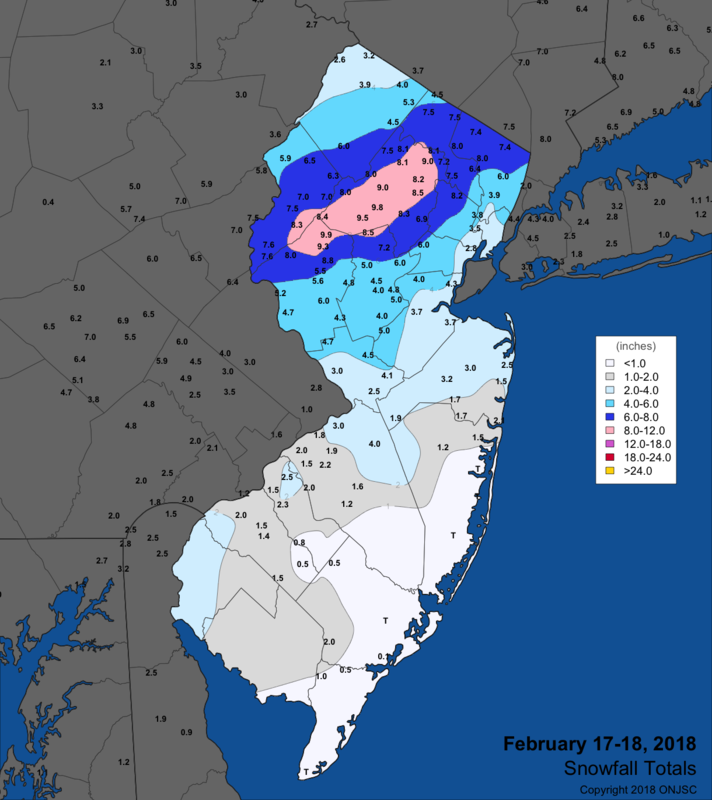 Largest snowfall in the 13 NJ counties where totals on February 17th-18th equaled or exceeded 4.0”. Figure 1. Snowfall totals from February 17th-18th, 2018. With tongue planted firmly in cheek, this was a “stealth” snowfall, as it was quickly followed by slightly above average temperatures on the 18th–19th. This preceded late spring warmth, which arrived on the 20th–21st to completely extinguish the snowpack. The record warmth of the 21st came to a close with some evening showers, the heaviest right in line with where the heaviest snow fell on the 17th. Though no cause and effect is suggested, Clinton and Greenwich (Warren) saw the most, each catching 0.73” and Lebanon (Hunterdon) receiving 0.61”. Most of the state saw little or no rain. That changed a bit on the 22nd, when a cold rain, some of which in the northwest was freezing, fell throughout NJ. The northern third and southwest received the most, with 0.71 in Little Falls (Bergen), Salem 0.68”, Rockaway 0.67”, and Hawthorne (Passaic) and Pitman each with 0.66”. The least fell along the coast. The final event of this stormy month arrived with some light showers during the afternoon of the 24th. This transitioned during the evening to a moderate to heavy rain that tapered off during the morning of the 25th. Northwest and upper coastal regions received the most, including Sussex (Sussex) 1.54”, Old Bridge (Middlesex) 1.50”, Manasquan (Monmouth) 1.50”, Colts Neck (Monmouth) 1.49”, and Montague 1.49”. Generally, 0.75”–1.00” fell in north and central regions, with lower amounts in Atlantic, Cumberland, and Cape May counties. With so many storms passing through the region associated with many airmass changes, it isn’t surprising that wind gusts equaled or exceeded 40 mph on ten February days. However, atmospheric pressure was generally on the high side during the month, topping off at an impressive 30.80”–30.85” on the 13th, thus pressure gradients were not large enough to generate gusts over the mid-40 mph range. The lowest the pressure fell was 29.55”–29.60” on the 16th. The 2nd found gusts up to 46 mph at High Point Monument (HPM; Sussex) and Fortescue, on the Delaware Bay shoreline in Cumberland County. HPM reached 44 mph and Fortescue and Mullica (Atlantic) 40 mph on the 5th. Atlantic City Marina (ACM; Atlantic) peaked at 42 mph on both the 7th and 11th and HPM 44 mph on the 12th. HPM reached 46 mph and Pennsauken (Camden) 40 mph on the 16th. The 20th saw ACM up to 40 mph, the 21st HPM to 42 mph, and the 22nd ACM to 44 mph. Exemplifying the warmth of February, there were nine days where multiple NJWxNet stations maxed out at or above 60°. Yet winter did not fully relinquish its grip, as 11 days saw one or more locations dip below 20° for a minimum. Still, there were an impressive five days where no NJWxNet station dipped below the freezing mark, nor was there a single day when the entire state remained below freezing. Only seven days saw all 62 NJWxNet stations dip below freezing. The maximum temperature topped the 60° mark for the first time in February on the 10th when Toms River (Ocean) reached 63°, and Berkeley Township (Ocean), Oswego Lake (Burlington), and Woodbine (Cape May) were all 62°. The 11th saw Mannington (Salem) at 67°, five stations 66°, and 32 sites between 60°–65°, while Walpack (Sussex) only made it up to 39°. Six stations reached 65° on the 12th. Cape May Court House (Cape May) led the way at 66°, with Kingwood (Hunterdon) 65° on the 15th. Cape May Court House was again warmest at 66° on the 16th, followed by Atlantic City Marina, Egg Harbor Township (Atlantic), and Vineland (Cumberland) at 62°. Remarkable warmth arrived on the 20th, with Toms River and Red Lion (Burlington) both leading the way at 77°. They were followed by six stations at 76° and 30 between 70°–75°. All other stations made it into the 60°s, except Fortescue, which, due to the southerly winds blowing across the cool waters of Delaware Bay, only made it to 54°. The warmth of the 20th was eclipsed on the 21st, a day which assumed the designation as the warmest February day in New Jersey on record. Stations with records back well over 100 years set a new February standard, including Trenton (Mercer) at 78° and New Brunswick (Middlesex), where the 79° high exceeded the previous record of 77° established just last year. The thermometer soared to 81° at Haworth (Bergen) and 80° at Newark (Essex), Oceanport (Monmouth), Wayne, and Jersey City (Hudson). 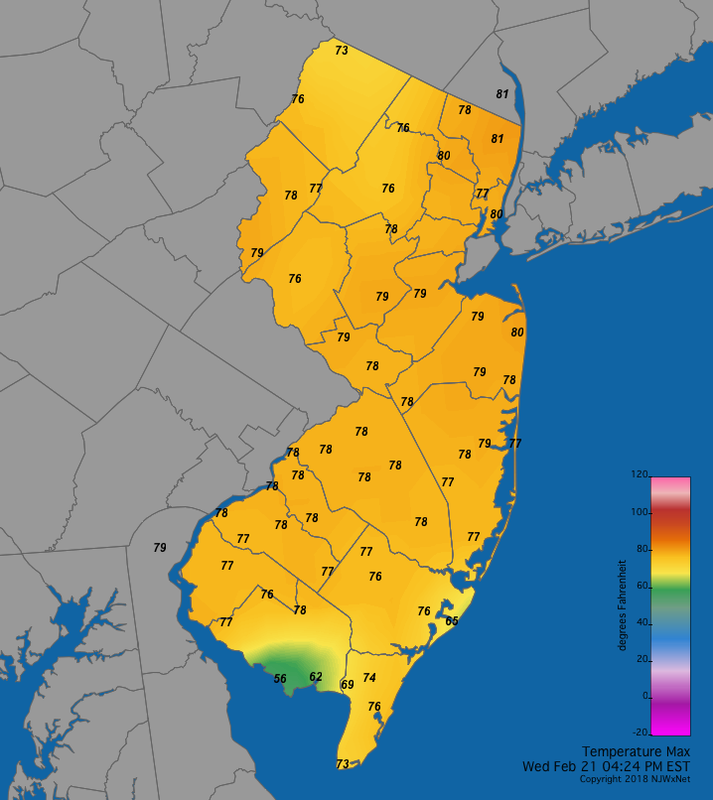 Some 29 NJWxNet stations topped out at 78° or 79°, with 24 others between 70–77°. Only four failed to reach 70°, three due to their proximity to Delaware Bay, namely Fortescue 56°, Bivalve (Cumberland) 62°, and Dennis Township (Cape May) 69°, with the fourth at Atlantic City Marina 65°. Figure 2 shows maximum temperatures at NJWxNet stations. Figure 2. February 21, 2018, maximum temperatures at NJWxNet stations. There have been three other February days in years past that rival temperatures on the 21st. This includes last year, when on the 24th Hamilton (Mercer) soared to 78° and Sicklerville (Camden), Walpack, and New Brunswick all reached 77°. The other two occasions were February 25, 1930, when Pleasantville (Atlantic) hit 80°, with Belleplain State Forest (Cape May), Indian Mills (Burlington), and Moorestown (Burlington) all up to 79°, and on February 24, 1985, when highs of 78° were reached at Lakehurst (Ocean) and Long Branch (Monmouth). A bit of warmth hung on in south Jersey on the 22nd, with Cape May Court House sitting at 67° shortly after midnight and six stations at 64° at the same time, prior to cooler air fully invading the state. Most of the sub-20° nights occurred during the first half of the month. The 2nd began a string of eight such days, with High Point Monument down to 5°, High Point (Sussex) 6°, and Walpack and Wantage 8°. The 3rd was the coldest February day, with Walpack, HPM, and Pequest (Warren) at 4°, 15 NJWxNet stations between 5°–10°, and the remaining NJWxNet stations between 11°–19°. The 19° location was West Cape May (Cape May). HPM fell to 20° on the 4th, with High Point and Walpack each 10° on the 5th and 11° on the 6th. Walpack dropped to 15° and HPM 16° on the 7th, Walpack was 10° and HPM and Pequest each 13° on the 8th, and Walpack 8° and High Point 10° on the 9th. HPM fell to 20° on the 12th, with the 13th bringing a 14° low to Walpack and 15° at HPM. Walpack and HPM were 16° on the 17th, with Walpack coming in coldest at 20° on the 18th and 17° readings on the 19th and 27th. With this past December and January averaging, respectively, 1.9° and 1.5° below the 1981–2010 normal and February’s +5.8° mean, the winter averaged 33.9° or 0.8° above normal. This ranks as New Jersey’s 27th mildest winter. Winter precipitation of 10.14” was 0.09” above normal. Thus the near-record wet February made up for a December that was 2.37” below average and January’s 0.71” sub-average total. The season ranked as the 59th wettest.